Welcome to the Korean Ham Radio Web Page of HL9HCT! Hello all, and WELCOME to my Korean Ham Radio Web Page. This page is dedicated to ham radio in Korea. Why Korea? you might ask!? I was stationed in Seoul, South Korea from August 1997 to August 1998. While I was there, I operated 2 meter FM from my barracks room. When I first got there, I had a 3 amp power supply and a 5/8 quaterwave antenna inside of my room - RF hell! After a while I purchased a 15 amp power supply with the help of a local ham for 70,000 won (about $45 at the time) and I upgraded to a J-Pole antenna that was hand made, purchased at a korean ham radio flea market (Held every month in Seoul). 1. You must be covered under the SOFA agreement (Be a US soldier, family member or DOD employee). * Numbers 2 and 3 may have changed - they were working on getting them changed just before I left there. If you contact the FCC, they can give you contact information in Seoul so you can get your HL9 callsign for the duration of your stay. I will also have a link to HL9DX's web page on here, so he may be able to help you out too (He's an American living in Korea). All HL9 callsigns are US hams, so if you hear one on the HF bands one night, make an extra effort to contact him or her. They will appretiate hearing an American on the radio. If you are a ham that contacted me when I was in Korea and never received a QSL card, please contact me! 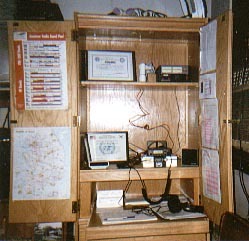 In the pictures above, you see the radio I used while in Korea. It was a Radio Shack HTX-212 mobile, hooked up to a 15 amp power supply. The antenna was a J-Pole just outside of my window, at the end of a piece of PVC pipe which was bolted to my window sill. The "shack" was inside of the standard GI issue desk/cabinet/dresser that we had in our barracks. In the first picture, on the left hand cabinet door, below the frequency allocation chart is a map of Korea with all the areas that I contacted highlighted. 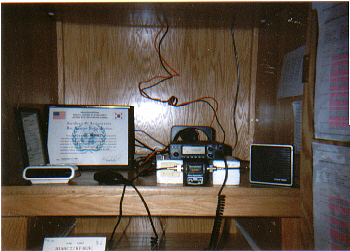 Next to the radio is my Korean ham license and on the shelf above, next to my power supply is my MARS license (ABM4HC). Korea DX Club - DS0DX - I've got their QSL card for a 2 meter contact when I was in Korea! The request line contained invalid characters following the protocol string.